The Bobcat® dozer blade attachment excavates and grades material with optimum performance and durability. The dozer blade turns loaders into mini-crawlers and it's ideal for construction and landscaping markets. The blade moves and pushes large amount of material quickly and easily, accomplishing jobs that would otherwise require dedicated equipment. Adjustable skid shoes provide depth control as well as forward and reverse grading action. 6-Way Adjustable Blade: Angles +/– 30 degrees and oscillates up to +/– 10 degrees, with electric-over-hydraulic controls for on-the-fly adjustments. 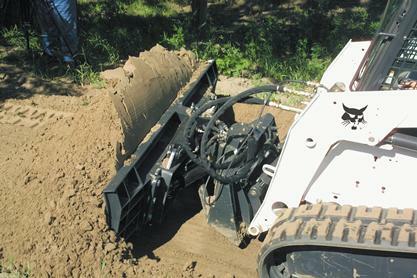 Adjustable Depth Guides: Mounted on the dozer blade attachment, adjustable skid shoes guide and control the depth of the dozer blade. Bi-Directional Operation: Operates both in forward and reverse for optimum grading action direction. Cast Design: Designed for handling the toughest applications. The 96-inch dozer blade model features an all-cast design for maximum strength, quickly becoming a dozing machine when combined with the tractive effort of a compact track loader. Fingertip Control: Featured on the 80- through 96-inch models, fingertip controls allow for easy, efficient and comfortable attachment adjustment.